The other day's post showed my new linen skirt and sleeveless cowl top that was recently completed. I wrote how the vertical stripe pattern in the lacy sweater knit looked a little 'wonky' when wearing due to the way the shoulders are pulled in to make the 'cowl'. 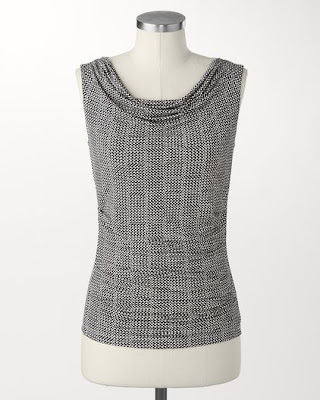 Last night looking at Coldwater Creek's collection, this top caught my eye. What do you think? Vertical stripes, softly draping cowl, nicely fitted sides, sleeveless tank. I really do love my top! and now I love it even more!! Love watching the progress on your sewing projects. Keep 'em coming! Oh, you are so right, it was a HUGE relief! I wondered the same, because it had never occurred to me that I could just choose to 'not' make the cardi until I struggled so with the material on the top and got so frustrated. Yet, that cardi had never felt right from the beginning. Maybe we are just simply too hard on ourselves sometimes Mama Pea!